The Fuzzy Pet Foundation/Issues/Factsheets/We Can FIX Animal Homelessness! We Can FIX Animal Homelessness! Consider this parable: You’re walking next to a river and you see a kitten floating past. You jump in and save the kitten. Then another one floats by, so you save that one, too. Then another and another and another float by, and you soon realize that you can’t save them all. 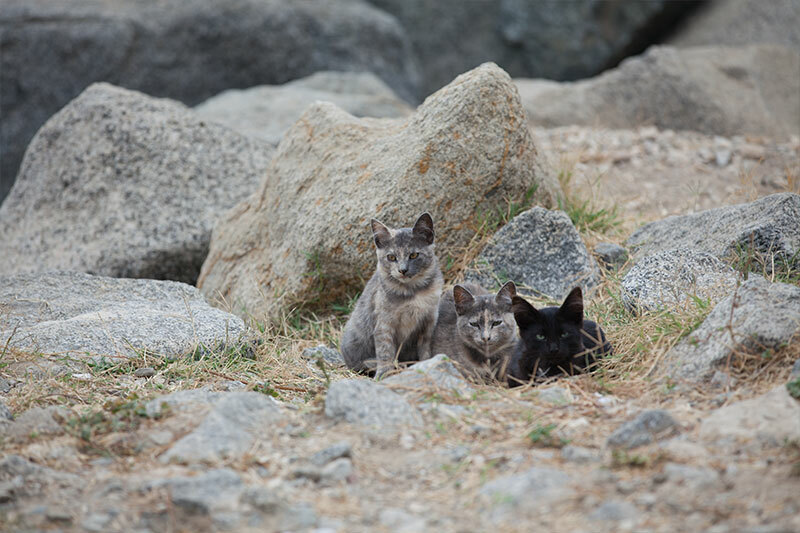 So you run upstream to see who is throwing kittens into the water – and you stop that person. Thousands of unwanted, abandoned, neglected, and stray animals pour into animal shelters across the country every day – far outnumbering the good homes available to take them in. But instead of “going upstream,” i.e., instead of working to address the source of the problem, which is the runaway animal birth rate, people are being pressured into focusing on the symptoms. We can end the cycle of animal births, homelessness, and deaths, but we must address the root cause instead of flailing in the water, pulling out one kitten at a time while so many others float by, and screaming that others in the water with us aren’t saving enough kittens. Finding homes for needy cats and dogs is gratifying, but to use another apt analogy, it’s like bailing out a sinking ship with a teaspoon – the boat will still go down unless we fix the gaping hole in the bottom. Finding a home for one dog may save one life, but sterilizing one dog will save hundreds, if not thousands, of dogs; lives by preventing generations of potentially homeless puppies from being born. Getting a spay/neuter laws passed saves even more lives. Stopping the problem at its source is where our time, energy, and funds are needed the most. That is how we can drastically reduce – and hopefully end – the homeless animal crisis and the need for euthanasia. Many groups striving to go “no-kill” use limited resources to provide temporary care; ship cats and dogs across the country (even though every state struggles with the same crisis); close their doors to the most needy animals – those who are in danger of abuse or are injured, sick, elderly, or aggressive; and even attack open-admission shelters that must euthanize animals. “No-kill” rhetoric lets the real culprits of the overpopulation crisis – greedy breeders and the “pet” trade – off the hook and keeps them laughing all the way to the bank. We must place and support ads that tell the truth: that breeders and pet shops are the ones that kill… shelter dogs’ chances of finding a home. It’s appalling to contemplate, but when shelters give in to pressure to go “no-kill” before they have overcome the breeding and selling of animals in their communities and before establishing sufficient spaying and neutering services, the results are often far worse for animals than a peaceful death through euthanasia. Animals still die – but in pain. Instead of a peaceful death in a caring person’s arms, animals die slowly and in agony on the streets, in backyards, under sheds, on chains, and at the hands of abusive people. In San Antonio, Texas – which is striving to be a “no-kill” city – the bodies of nearly 12,000 cats and 16,000 dogs were scraped off the streets and properties in just one year. One animal control officer termed it “euthanasia by proxy.” It is also becoming common for shelters that boast high “save rates” to have a sky-high rate of unassisted deaths in cages and kennels from illness or injuries. Animals spend months or years in cages. Experts agree that after as little as two weeks in a traditional shelter, animals can begin to deteriorate psychologically and become withdrawn, depressed, anxious, or aggressive. If adopted, animals who have been confined for extended periods are often repeatedly returned because of behavioral issues – a traumatic yo-yo experience that makes them even less adoptable. Animals are cast out and they keep on reproducing. To increase “save” rates, some shelters promote animal abandonment. One big sanctuary recently issues a news release urging Good Samaritans to leave homeless kittens on the streets, rather than taking them to a shelter. That’s madness: Not only are abandoned kittens in danger of infection, disease, starvation, and being hit by cars, attacked by dogs and wildlife, and abused by cruel people, the surviving ones will also eventually go on to reproduce, resulting in even more homeless animals. Animals are handed over to abusers and hoarders. When numbers become the priority, animals are no longer viewed as individuals deserving of consideration and respect but instead as inventory that must be moved, causing shelters to toss aside even basic safeguards. Homeless animals are increasingly being found tortured and killed by adopters who weren’t screened or, even more commonly, caged in hoarders’ filthy basements, garages, sheds, and barns. Every day, headlines appear about raids on self-described “rescuers” and the animals – both sick and dead – who were removed from the cruel and disgusting conditions in the homes of the “rescuers.” When one hoarding facility masquerading as a “rescue” in San Jose, California, caught fire, nearly 100 cats burned to death inside carriers, unable to flee while the plastic melted down on top of them. Profiteers that breed and trade animals for a buck are succeeding because the powerful voice of the animal rights movement is being diluted and because good activists are being misled into attacking one another rather than those who are making money off the backs of animals: pet shops, breeders, and phony “rescues.” We can wipe out animal homelessness by working together to strike at the root cause, including by lobbying for laws that have proven effective in reducing unplanned births and shelter intakes in communities that enforce them and by developing low-cost or free sterilization programs for cats and dogs in every community. In other words, by stopping animal homelessness before it starts.